Home › Home and Kitchen › Cooking Thermometer Feelle Ultra Fast Instant Read Digital Electronic Barbecu.. Cooking Thermometer Feelle Ultra Fast Instant Read Digital Electronic Barbecu..
SUPER FAST THERMOMETER-Instant digital readout within 4-6 seconds, oF/oC switchable, Auto Shut-off and HOLD feature, large LCD display. Easy to carry and store in your kitchen drawer. Perfect for Kitchen, Outdoor Cooking, BBQ, Liquid, Food, Meat, Candy, Coffee, Milk and Bath water,air temperature. HUGE TEMPERATURE RANGE - Massive 630F temperature range with both Fahrenheit and Celsius readings with highly accuracy - Range: -58F to 572oF (-50oC to 300C). EASY TO STORGE,PORTABLE-There is a strong magnet on the back of the thermometer. Can be hung on a refrigerator, stove, Barbeque Grill, or metal cabinet. It also has a hang hole for easy storage. 100% MONEY BACK And LIFETIME GUARANTEE-Now Share it with your family and friends, do not miss the good times this thermometer can bring you! Size:Collapsible It features Wide temperature range from -58F to572F(-50C to 300C) Easy to read LCD display which auto shuts off toextend battery's life Small and portable,easy to carry and storage,Made ofhigh quality stainless steel and collapsible internal probe is very safe. Waterproof and handy design Hold function records previous temperature High Quality : Made of high quality food grade stainless steel and ABS caseplastic material,this thermometer is perfect for indoor or outdoor use.Response Time: 4-6 seconds fast temperature sensor F/C Configurable:Yes(Turn off and folder the thermometer first before the F/C swtich mode beeffective ) Hold function records previous temperature : Yes 1PCs AAABattery required(Not included!) - If you are unhappy with our product we willrefund your money. Our product is backed by a 100% Money Back No QuibbleGuarantee! 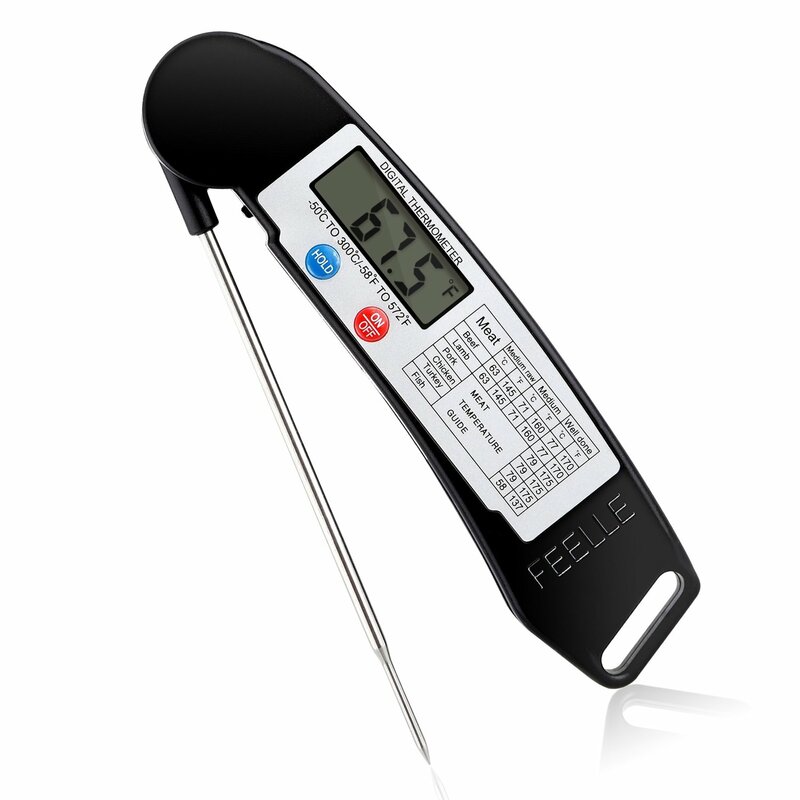 Click the ADD to CART button now and get your very own cookingthermometer today!